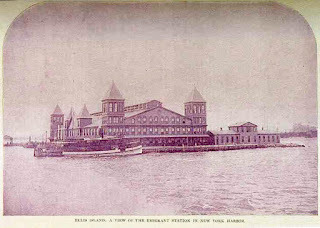 Heroes, Heroines, and History: Ellis Island Hospital AND Giveaway! 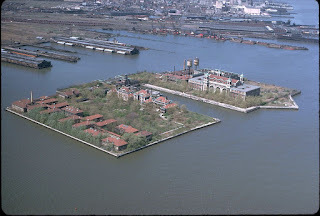 Ellis Island Hospital AND Giveaway! Ellis Island-- When you hear that name what does it make you think? Millions of immigrants flooding into our country? That's what it has always made me think. 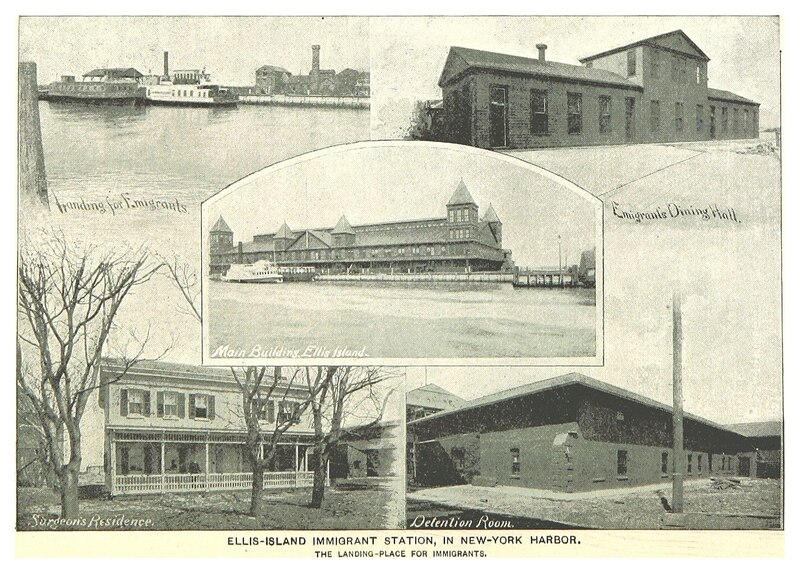 But the immigration center was just a part of the history of Ellis Island. Let me share with you some interesting facts that goes beyond the immigration center. It didn't take long with the flood of immigrants coming into the country to realize checks and balances were needed. They couldn't bring in sick people and expose the United States population to possible epidemics of tuberculosis, typhus, cholera, or trachoma (contagious bacterial infection of the eye). Before the time of antibiotics, all these diseases could be devastating if they hit the vast population. It was in September of 1892, the year Ellis Island opened for immigration that a ship arrived in port with several cases of cholera. The Island had no hospital. Every ship then was put in quarantine to check for disease before allowing to proceed to land. The passengers found to have contagious diseases were then taken off ships at quarantine and transferred to one of two hospitals on either Hoffman or Swinburne Island. When the original immigration building burnt down they immediately made plans to rebuild, but they added a hospital and surgeons house to the plans. New immigration center built after the fire. Because of the belief that diseases could not cross a body of water, they chose to put the hospital across a body of water--but they had no close neighboring island. Remember this was still in horse and buggy day! I found this particularly interesting. 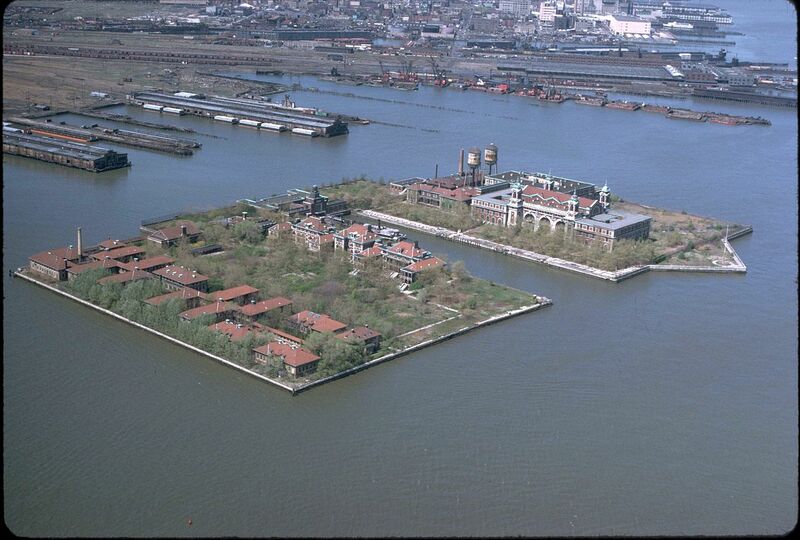 They needed more buildings but the small three acre Island wouldn't hold what they needed so they built an island. To create the land they needed, they drove wooden pillars down into the ground beneath the water, putting them tightly together. When they had formed their rectangular outline with tight wooden beams, they pumped the water out of the center. Then they used the debris acquired from digging the subway to fill the massive hole and make the Island. Two Islands were eventually built to fill the growing needs. The first new Island housed the hospital administration and contagious diseases ward. The second new Island housed the psychiatric ward. With the edition of islands, Ellis Island grew from 3 acres to 27 acres. During the first World War immigration dropped drastically. 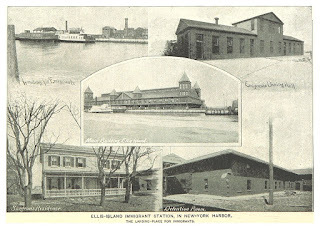 In 1917 the island was used as a hospital for the United States Army. The Navy used it for a way station and also a detention center for enemy aliens. Just a year later the Army takes over most of the island and makes a way station to treat sick and wounded American servicemen. 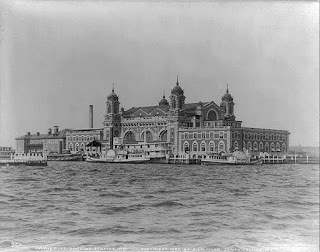 If you'd like to read more about Ellis Island and more interesting facts and famous people who came through the Island you can read another post I wrote here. Do you have any family members that came through Ellis Island? Have you done any research into your family genealogy? Was you surprised that two of the islands were man-made back in the late 1800's. 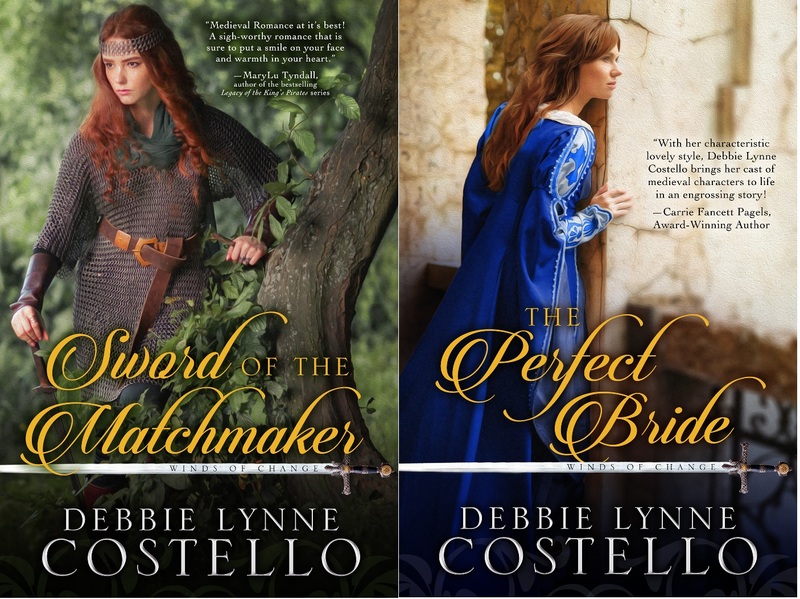 New covers for my novellas! If you'd like to be entered to win choice of these books and choice of format answer one of he above questions or leave a comment below. Don't forget to leave your email address. Interesting post! My paternal great-grandparents came into the Baltimore port, but I did a bunch of research about Ellis Island while I was trying to find them. Thanks for sharing. Thank you, Debbie, for an interesting post. I learned new facts about expanding the facility with manmade island. I am a first generation American. My parents, grandparents came from Scotland in the 1920s. I loved hearing their stories of arriving with very little money, going to work for Henry Ford on the assembling line. Five dollars a day was introduced by old Henry and drew immigrants to Detroit. So happy my grandparents took the risk to embrace a new country. Oh my gosh, Diane!!! That is so exciting! I am secretly in love with Scotland and I've never been there. I love the pictures of the country. It is so beautiful with the moors, hills, cliffs, ocean, rolling green meadows. Such a beautiful country. Our next trip is going to be to Scotland. I bet your parents and grandparents had strong brogues. Did you pick any of it up? Do you live in Michigan now? My grandmother worked for Fischer Body from 1935 to 1976 0r 78 I believe. Wow! I did not know that those sections were manufactured! I loved this post! Not sure if my ancestors came through Ellis or not. Hey Connie. I found it so fascinating! I tend to think that kind of engineering is modern but apparently not! Not sure anyone in my family's history came through Ellis Island. Thanks for writing such a great story from history! Thanks for the chance at this giveaway to! Thank you for coming by, Diane! Good luck in the giveaway. Hey Debbie, I think I might do the ancestory.com. I just found out I have Native American blood in me! Both my paternal grandparents did. My grandfather in 1909 with his parents and siblings and my grandmother in 1922 by herself at just 16. Her sister came through a year later 1923 and my understanding is they closed ellis island after that. Wow Kim. Can you imagine at 16 coming through by yourself. What a brave young lady. These people are really heroes! Hey Sonja. We sure can learn from the past. Its too bad our government wants to pretend things didn't happen! Thanks for coming by! Great new covers, Debbie Lynne! Thank you, Melissa! Hope you are doing well. That's really interesting how they made an island. I can't imagine traveling so far then getting sick and maybe never being allowed into the country. Me either, Vickie. But I did read it was only like 2% who actually was sent back. Very interesting information, Debbie Lynne. Ellis Island is a place I would like to visit. We were right there 15 years ago and never went over to Ellis Island. I could kick myself now! Wow, Debbie Lynne, very interesting post! I did not know that about the man-made islands or that they could even do such a thing in the 1800's! I would like to visit Ellis Island one day. I have done a bit of my family genealogy, but I am not sure if any of my ancestors came through Ellis or not (I have not found anything indicating they did...yet). I do know that they came through Pennsylvania, traveled through Maryland and ended up settling in Virginia. So, it is very possible that they did. The new book covers are lovely. Thank you for a chance to win a copy. Thanks for coming by, Tina. That's great you've been able to track your genealogy so thoroughly. I love learning things about my ancestors. So interesting! Isn't that the truth, Jennifer! I was thinking the same thing. We have just benefited from all the knowledge of the generations before us! Debbie, I am very surprised to learn about the man-made islands. This was a fascinating post. 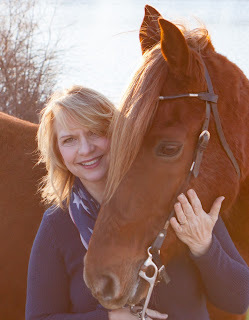 Thank you, Connie! I had so much fun researching it! I didn't include much about the hospital in my post a few months ago because there was so much to learn about Ellis Island, and mine was mainly about the Statue of Liberty. I had my heroine be able to skip going through all the inspections and exams because she was sponsored by an American business man to be a governess. I sure learned a lot and your post adds more to it. My great-grandparents came long before Ellis Island in the early 19th century. Thanks for more information. I love that about the man-made islands and the technology available then. Hey Martha, There is so much on Ellis Island! I was like you trying to decide what to include. EI is full of rich history. Somewhere in the back of my mind I recall hearing that Ellis island was man-made, but had never done much study on it. And yes, I've heard many a story on people getting sent back to their country, or quarantined for disease, etc. Don't know if any of my relatives came through Ellis Island specifically. We were going through some of my mom's great-grandmother Breitenstein's papers on some of her family history, as she had been writing down and researching some of that. From her writings she recalls her grandfather was an officer in the army in Germany, but ended up leaving Germany around 1889 for America. And then her grandmother was born in Austria, and was a doctor there, or in Germany, but later her family came to America, and it's in America where they met and got married etc. Interestingly, Breitenstein is supposed to be a Jewish-German name, so I just may have some Jewish roots. This I need to explore. According to Wikipedia, Breitenstein is also a town in Austria, but don't know if this is the precise town where my mom's great grandmother's grandmother was born. 'Tis possible though. Names match. Hey Amber, Sounds like you have some interesting heritage. How fun would that be if you were a princess of Bavaria! Thanks for coming by and good luck in the giveaway! I've had family members do our genealogy but do not recall where they landed coming from Ireland and England. I've read about the separate buildings and how ill family members were separated from loved ones after arriving. Hey Marilyn!! So glad you made here. :) Sounds like a fun a girlfriend getaway! My sister, sister-in-law, and I do that in October/November and work on Christmas gifts. That had to be heartbreaking to come so far with so much hope and then get sick and find out you couldn't go with your family or for the family to have to walk away and leave someone. Thanks for sharing! Wow! What a fascinating post! That blows my mind that two of the islands were man-made back in the late 1800's. The ingenuity of how they did it is amazing! Thanks for sharing, Debbie! Hey Alison! I had the same response as you! I just couldn't believe they were able to do that back then. Truly amazing! I have no idea if any family went through Ellis Island, but I loved the history lesson. Thanks for sharing! Hey Kacie! Thanks for coming by. I'm glad you enjoyed the post. I could not believe the spelling of your name! My daughter's name is spelled the same. I've only known one other Kacie and she was named after my daughter. So fun to meet someone else with the same spelling. Thanks for sharing this history and for the giveaway opportunity to win a book. I loved The Perfect Bride!!!! But then you know that :-) I don't know if I have Sword of the Matchmaker. I'll have to try and unearth some books that are still boxed up. Haha. You sound like me, Anne. All my books are in boxes. I can't wait to unbox them and put them on the shelves Joe is going to put in my writing room. One whole wall of shelving! Hey, Debbie. My grandparents came over from Holland, but died when I was so young I don't remember them. I haven't heard any stories concerning them & Ellis Island. I recently read a book about a family who came here from Italy & the grueling, scary process they had to endure at Ellis Island. I'm amazed that they could actually build an island way back in those days when they didn't have the technology that we do today. Fascinating! That is interesting, Diana. I have family who still lives in Holland. My great aunt passed away a few years back and she was the one that kept contact with them so we've lost that link. As I mentioned above my great-grandfather was a stow-away on a ship out of Sicily. Guess they are fortunate to have sidestepped the Ellis Island process! It is still hard for me to fathom how they built those Islands with out the technology we have. That had to be some VERY hard work! My Grandfather on my Mom's side came to Ellis Island from Ireland. His name was Farrell Patrick O'Reilly, and he married my Grandmother who was born in New York on the Mohawk Indian Reservation in 1898. That's interesting, Judith! So neat to know your family's heritage. Thanks for coming by! Congratulations Kacie! You won choice of my books.